In December 2009 Harald Bresselschmidt, celebrated chef patron of Aubergine Restaurant, opened his new venture, AUSLESE, a specialised wine and food pairing venue. Auslese is conveniently situated in an historic building in Gardens, Cape Town. The décor is simple and classic, reflecting the history of the region. 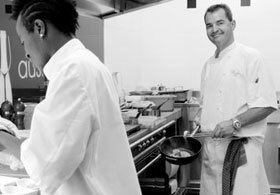 Harald’s vision is to enhance the Cape’s sophisticated tradition of viniculture by encouraging the appreciation of wine and food pairing. Auslese offers an exclusive setting in which to introduce and showcase new and exciting wines and vintages. Harald’s exquisite hors d’oeuvres bring out the best in the wines on show through complementary and contrasting flavours. A true gastronomic delight! Incorporating elegant reception rooms and an expertly designed maturation cellar, Auslese caters for a range of possibilities - from smaller intimate wine pairing lunches or dinners to larger more informal launches of up to 150 guests. All functions are pre-booked and tailored to your specific needs. We regularly host public wine pairing dinners and music events so please go to our Events page or sign up for news about upcoming events. Harald and his team look forward to welcoming you and your guests to inspiring journeys into the marriage of wine and food.